I thought I would take a step back and go to the beginning of the Learning Centers course where Ms. Maxine Edwards Cornwell explains the meaning and the benefit of learning centers. A learning center is defined as "an area within a child care facitly where children can gather in small groups to focus their attention on specific kinds of play activity." A functional learning center is one that teaches. A functional learning center is one that does what YOU want it to do. You create the center with a certain goal in mind, and it is functional when it meets that goal. She also states learning centers are constantly changing because they are incorporating lesson plans from the teacher. She explains that teachers need to be creative. Creative means that one has the ability to think about one think in many different ways. This enables us to take one learning center and constantly change it for our needs--we become creative. Yes, it may take a while to get in this creative "groove," but don't worry one catches on. And, creativity is contagious. If you are creative, you will help to develop creative children. "1. Center-based play gives children clear choices. 2. Center-based play helps children develop social responsibility. 3. Learning centers are great for integrating a variety of activities around a theme. 4. Learning centers are interesting. 5. Centers provide learning opportunities for more than one developmental stage." 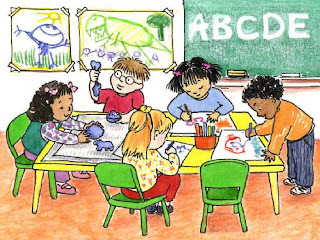 Clear choices: Learning centers available for the day should be presented to the children at circle time. She suggests using pictures on a board to let children know what centers are available. She does emphasize though that one should not use words with the center pictures. She says that "non-reading children become easily discouraged and distracted from the confusion of the words they can't interpret." That's why she suggests using drawings. She also says that a teacher should "never, never, never let children hear them say they can't draw." If a teacher models confidence, it breeds confidence. Develop Social Responsibility: With centers children learn to take care of things--and people. They should be taught to clean the area when they are done so that other children can enjoy the center also. Integrating Themes: learning centers give a great boost to the effectiveness of your teaching. Since children learn best using ALL their senses, different centers based on the your themes allow the children to experience the theme with all their senses. Centers are Interesting: "Good centers keep boredom at bay". There are so many areas for children to choose from, and these areas are always changing. There's no time to get bored. Multiple-Stage Learning Opportunities: Every center caring for young children, has children of many different levels of development. Learning centers allow each child to develop the skill at their own pace, beginning where they need to begin, and taking the time they need to complete the learning process. It's done on their time, at the level they are comfortable with. So there they are. I must be honest, when I read this I thought--Oh My! I don't think I could ever do this. The work involved, the brain activity that would need to take place. I don't know if I have it. As one reads on though, one realizes the fun the children could be having and the fun the teacher could be having with the centers too. I must confess, that I plan to start integrating centers better next year, but it may take me a while. I hope to someday measure up ever so slightly to Ms. Cornwell. I have always loved center learning. When I student taught in Kindergarten, we did centers and we used alot of pictures, like you said. Also, I loved integrating the centers with the theme- for example if I was teaching Deserts, the art center and math center would relate. We counted "desert snakes" that we made with clay, etc. It's also great to have the kids in different groups because it gives you the opportunity to work with smaller groups as you rotate around the room. (I never sat at my desk very often as a teacher- you probably figured that out already. Plus it was covered with too much paperwork anyways- he,he.) Excellent article! We usually set up our room learning-center style. Since I teach 2 year olds, we don't have a meeting about it. They come in, wash their hands, and get to "work" wherever they choose. I must say I disagree about putting words on the pictures. Most kids will ignore the words entirely, so they aren't hurt by them. The children who are ready to notice the words can't notice them if they're not there. I think you ought to try it both ways, with just pictures and pictures with words. If no one is bothered by the words, keep them so that kids are exposed to functional text in their daily routine.